Wash the mint leaves in water. In a tea pan or tea maker, add water. Add the mint leaves. Boil the water for 3-4 minutes till the flavors and aroma of the mint starts infusing in the water. The water will start becoming green. Let the quantity of green color in the water increase. Add the tea leaves. Add sugar. Now add milk and let the tea come to a boil. Your Pudina Chai is ready and you can serve it. Serve the mint tea with light tea-time biscuits. You could also have this mint tea after lunch or dinner as it aids in digestion. If using tea bags, then put off the burner. In the hot water, dip the tea bags for 2-3 mins. Add sugar and hot milk. Stir and serve. Adding Milk or not is entirely your option. If you add milk, it becomes Indian Chai. I have not mentioned the quantity of milk as some people prefer less milk and some prefer more milk in their tea. Ditto with sugar as the preference for more or less sugar varies with peoples' tastebuds. I have had Mint tea both without milk and with milk and personally, I like both of them. Use of honey, jaggery or any other sweetener is also possible. 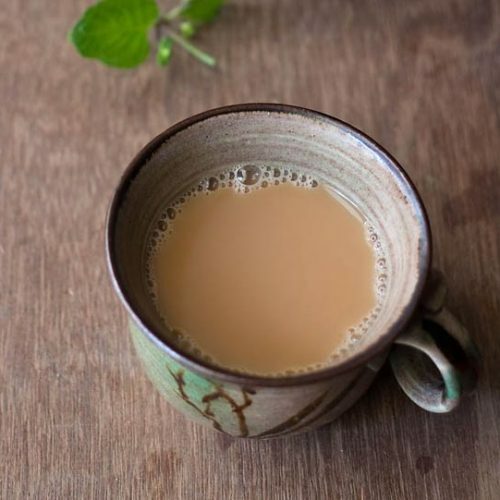 In India though, for the indian chai, generally sugar is used. If you use milk, then you could use honey. I do not know how jaggery will taste with milk.